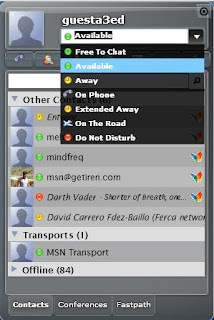 Chatab is a multi-protocol web-based instant messaging service. It is a fast and practical way to get connected no matter where you are located. Chatab has a built-in browser that lets you chat and browse at the very same time. Chatab supports many IM networks and social networks such as Facebook, MSN, Yahoo, GTalk, Gadu-Gadu, Myspace, AIM, LiveJournal, QQ, ICQ, XMPP. You can register and create your very own account at the site, or log in directly to your preferred instant messaging service and start chatting away.